Ratheesh Pulparambil Research Officer (Ayurveda), Regional Ayurveda Research Institute for Life Style related Disorders, Poojappura, Trivandrum, Kerala, India. Abhayadev A Research Officer (Ayurveda), Regional Ayurveda Research Institute for Life Style related Disorders, Poojappura, Trivandrum, Kerala, India. Varsha Sumedhan Research Officer (Ayurveda), Regional Ayurveda Research Institute for Life Style related Disorders, Poojappura, Trivandrum, Kerala, India. Meghna P. P. Research Officer (Ayurveda), Regional Ayurveda Research Institute for Life Style related Disorders, Poojappura, Trivandrum, Kerala, India. Srinivasan M Research Officer (Biochemistry), Regional Ayurveda Research Institute for Life Style related Disorders, Poojappura, Trivandrum, Kerala, India. Sudhakar D Assistant Director (in-charge), Regional Ayurveda Research Institute for Life Style related Disorders, Poojappura, Trivandrum, Kerala, India. Sunil kumar S Professor, Department of Shalakyatantra, Govt. Ayurveda College Trivandrum, Kerala, India. Kannadas C. S. Professor & Head, Department of Shalakyatantra, Govt. Ayurveda College Trivandrum, Kerala, India. Glaucoma is a diverse group of disorders affecting the eye with a common characteristic potentially progressive optic neuropathy that is determined by both structural changes and functional deficit in which IOP is a key modifiable factor. In Primary Open Angle Glaucoma (POAG), IOP independent mechanisms of glaucomatous nerve damage and visual field loss with unobstructed angle of anterior chamber is observed. The patient has reported gradual diminution of peripheral aspect of visual field (Rt. eye - 6/12 and Lt. eye - 6/12 on Snellen’s distant vision chart) in both eyes for 2 years. There was marked peripheral field defect on both confrontation test and perimetry visual field analysis test. The disease shows clinical similarity with Kaphaja Adhimantha, a disease affecting the whole eye mentioned in Susruta Samhita and Ashtanga Hrudaya. It is a chronic disease comes under life style related disorder. Dukhena Roopam Pasyathi (distorted image or constricted visual field), Sirodukha (headache), Srava (watering), Kandu (itching), Pamsupoornatha (foreign body sensation), Aviladarsana (diminished vision) and Gourava (heaviness of eye and head) are the clinical findings explained in the context of Kaphaja Adhimantha. These clinical finding mentioned in classical literature shows resemblance with POAG. The meticulous deployment of kaphaja Abhisyandha- Adhimantha treatment protocol can be used to prevent the progression of ganglionic damage and preservation of eye sight. The logical interpretation on the basis of both subjective and objective clinical findings concluded the diagnosis as Kaphaja Adhimantha and treatment principle adopted was Apatharpana, Kaphahara, Abhisyandhahara and Srothovisodhana. After treatment his vision has improved as 6/6 (Rt. Eye) and 6/6 (Lt. Eye) and remarkable change in field analysis. The study discusses about the effectiveness of Ayurvedic management in POAG. PULPARAMBIL, Ratheesh et al. EFFECTIVENESS OF AYURVEDIC INTERVENTION IN PRIMARY OPEN ANGLE GLAUCOMA (KAPHAJA ADHIMANTHA) - A CASE STUDY. 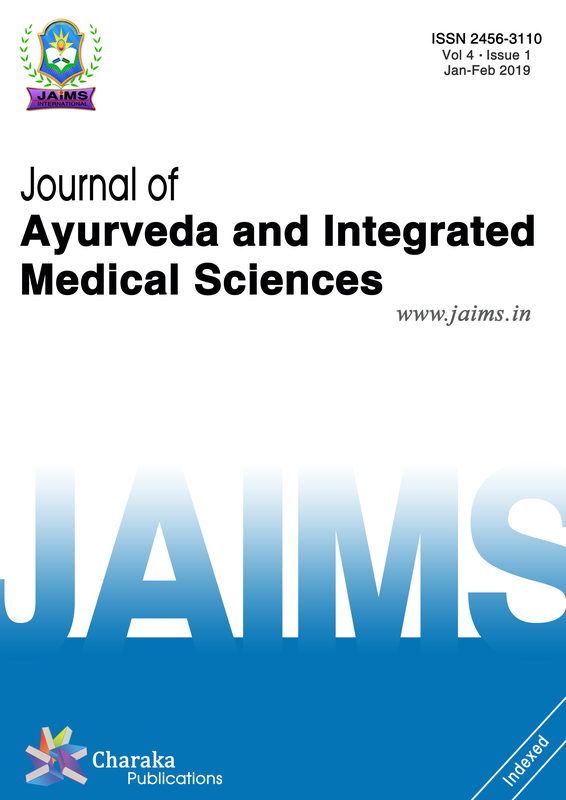 Journal of Ayurveda and Integrated Medical Sciences (ISSN 2456-3110), http://www.jaims.in/index.php/jaims/pages/view/Citation, v. 3, n. 4, p. 210 - 219, aug. 2018. ISSN 2456-3110. Available at: <https://jaims.in/index.php/jaims/article/view/626>. Date accessed: 25 apr. 2019. doi: https://doi.org/10.21760/jaims.v3i4.13314.